This statistic shows the prospects of investment and development in the industrial and warehouse real estate market in Europe in 2018 and 2019 according to industry experts. 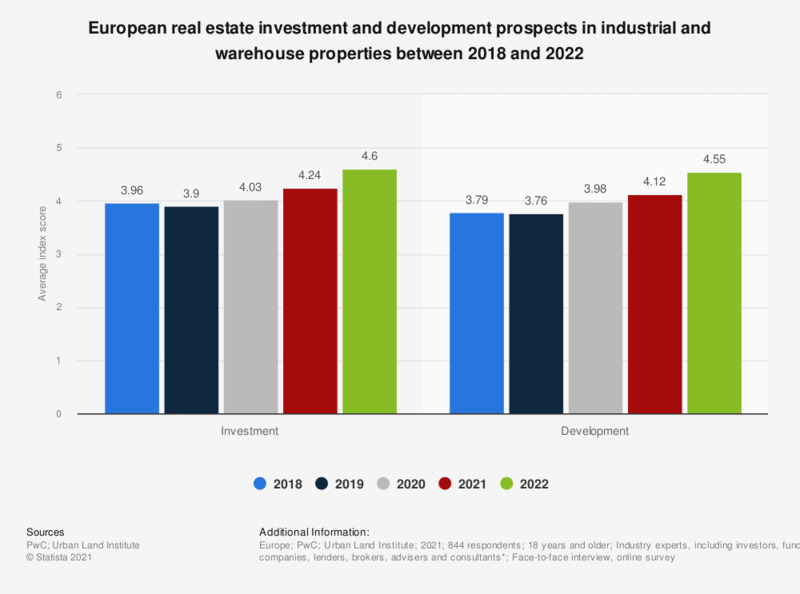 For both investment (3.9) and development (3.76) of industrial and warehouse properties in Europe in 2019, the outlook according to industry experts looked good despite falling from 2018's prospects. * The survey was made up of respondents from twenty-two European countries and made up from the following professional industries. The source adds that respondents could choose more than one category, so percentages do not add up to 100. Real estate service firms (30 percent), Fund/investment managers (24 percent), Private property company or developers (23 percent), Institutional/equity investor (15 percent), Bank, lender or securitized lender (7 percent), publicly-listed property company or REIT (11 percent), homebuilder or residential developer (6 percent) or other (4 percent).